Every now and then, when we open up one of our compost piles after they’ve been sitting for several months doing their thing, we uncover a pile which hasn’t quite broken down everything the way we want or we find lots of plastic strips that were not removed from boxes. Sometimes the odd cake box wasn’t waxed like we thought but rather plastic coated and causes issues in the composting process. While our wonderful composting organisms try their darnedest to break down the plastics, it’s evident that the plastic short circuited the decomposition on the underside of the deposit. When these frustrations arise, we rise to the challenge and create our spud-compost-mansion. “What on earth are you on about?!? !” you say. 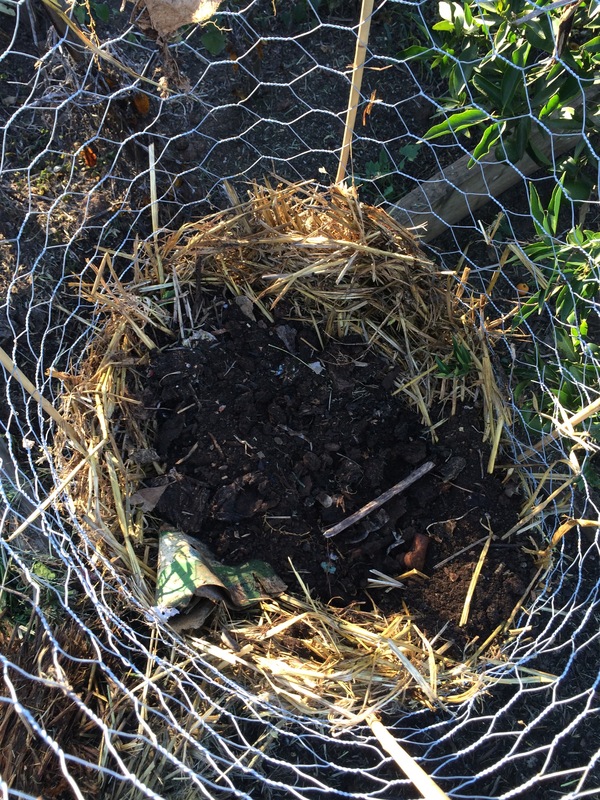 Put simply, it is a chicken wire basket that is lined with mulch on the bottom, composted straw around the sides, half finished compost on the core and spuds all around! Create a round wire basket and anchor it with stakes. We used chicken wire offcuts and bamboo stakes. The bamboo stakes are smooth and can be woven through the wire. Chicken inspection is optional. The wire basket is held in place by bamboo stakes and since we were being lazy, we used our electric mulcher to break down some weeds into a fresh mulch bed. I’d like to say that our logic is based on scientific fact… Rather it’s based on observation. We need to ensure that the too much moisture doesn’t leach out from the pile, and anyone who’s mown a lawn before and left a pile of clippings on the garden can attest to the fact that, fresh lawn clippings create a dense also impenetrable layer. So this is our retention mulch. The next layer is rotten straw. We place a good wad of it on top of the mulch in the wire basket, then start lining the sides of the basket with it. Here is a pic of just that. 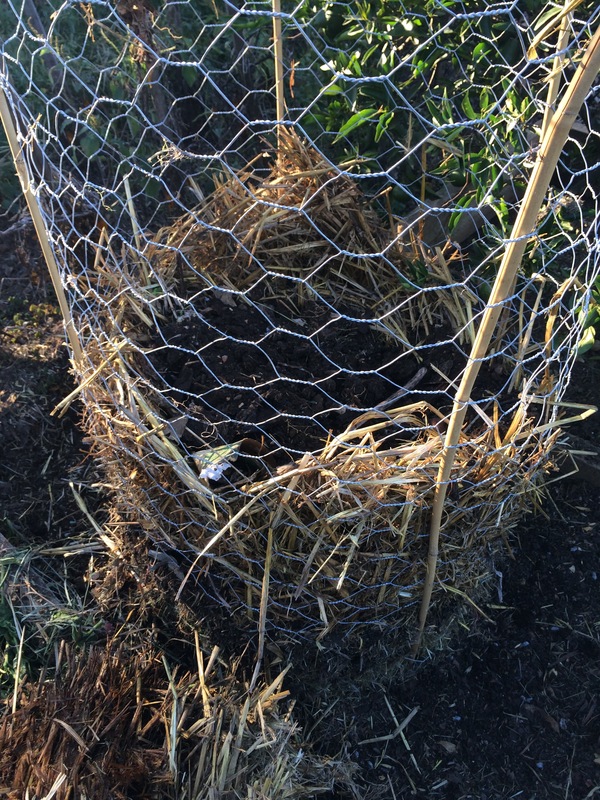 Wire basket with mulch base and rotten straw lining. Next, we shovel in a layer of partially finished compost and add our chitted potatoes around the straw edges and back fill it with more compost. Voilla! You very own compost-potato-mansion. Once the spuds have sprouted, be prepared to keep adding straw lined walls and compost backfill all the way to the top of the wire basket. We wished we had a photo of last years’ one. It was awesome! 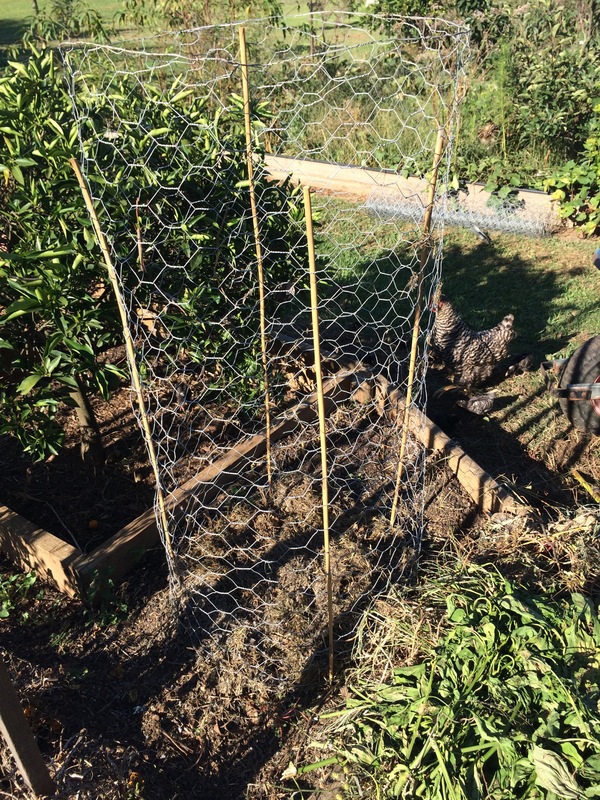 This design tends to keep possums away from you spuds too, which is handy in an urban setting, and then when it’s time to harvest the potatoes, you don’t need to do anything special than pull apart the wire mesh, harvest and spread out the spent compost on your garden. Almost no work at all! We have started setting up a few of these baskets all around our garden so that when we are weeding, we slowly fill the basket and it composts away. Then we can use it straight in the garden without having to use a wheel barrow to cart it around. Win-win! Growing something from a seed always gives us a sense of achievement. It’s amazing how something so tiny can hold enough information in it to grow something unique. Related plant species all have seeds that look identical. Ever looked at a cauliflower seed, cabbage seed and kohl rabi seed next to each other? They look identical! Seeds have a shelf life. As they age, they dry out. Some seeds have a harder outer coating and can survive for years or even decades before successfully germinating, while others can only survive until the next growing season. 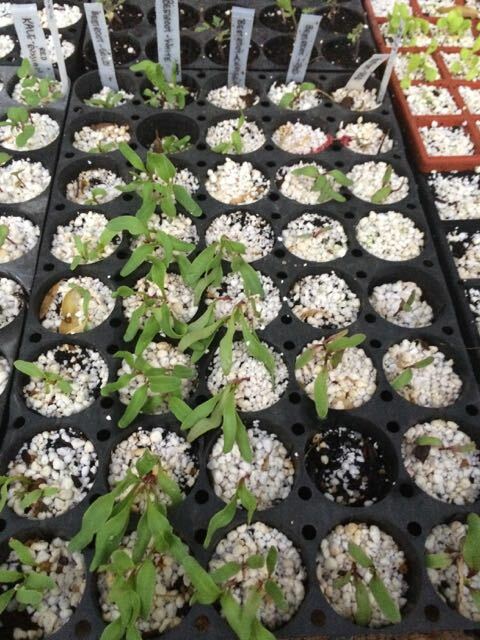 Because each plant is different, to ensure you have the best germination rate, have the freshest seeds possible. There is nothing wrong with older seed, as long as you realise that you may need to plant more seeds than normal to ensure that enough plants germinate. When plants flower, they pollinate each other. There are different ways that plants can be pollinated; by wind, insects (not just bees either), self-pollinated or manually. Open-pollinated essentially means that pollination has occurred naturally and not been interveened with by us well-meaning humans. There are some risks with open-pollination though, namely the fact that related plants may actually contribute pollen to other plants and thus produce a cross breed. Anyone who normally saves seed, needs to ensure that there are no similar plants in the vicinity that will proceed a cross breed. This essentially means that the seed will grow to be like its parent. Having cross-pollinated seed is a fun way of having surprises. But if you want to grow something specific, it is a nightmare. If you are purchasing open-pollinated seeds that are marketed as true to type, the producers have probably gone to extreme lengths to ensure that this is true. Looking at corn again, it is a wind pollinated plant. This means that to have open pollinated corn, you must be confident that there is no corn growing within 1-2km radius. We are lucky enough to be able to do this, which is a bonus! A plant that has successfully produced seed in your local area is more likely to produce very hardy offspring that are well suited to your conditions. It may not seem like a significant concern, but it can make a load of difference. 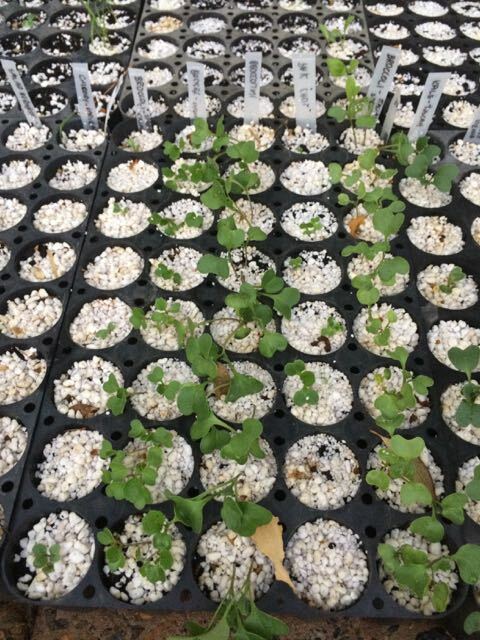 In the seedling trays above, there are two types of seedlings. The first are all beetroot and the second are all broccoli. In the first image, the second row of seedling is far out performing the rest, whereas in the second image, the third and fifth row are outperforming the rest. These rows were grown from seeds that we have produced ourselves and purposefully stressed to local conditions. Need we say more! There are lots of vegetables around that most people have never heard of, let alone see. “Cucuzza” is one of those. A rarely known vegetable, this one goes by several names; “Cucuzza”, “Kudu” and “New Guinea Bean” are some. This is an annual gourd which grows in the same manner as a climbing cucumber or pumpkin. It grows to around 2m (6 foot) when mature, but it is best picked when it is around 60cm in length. It tastes similar to a zucchini and can be used in a similar manner. As this is a Summer vegetable only and we love to make this with pasta. If you can get your hands on one, here is what you can do. Ingredients: One onion, 1 garlic clove, 500mL tomato sauce, one cucuzza, 500g of your favourite pasta and salt/pepper to taste. 1) Chop and fry your onion in a large pot until soft. While this is cooking, peel then cube the cucuzza. 2) Add the cucuzza to the fried onions and cook for 10 mins. Stirring occasionally so the cucuzza does not stick to the pot. There are three little beasties that frighten us as we attempt to grow our produce using biodynamic and organic means, they are the Queensland Fruit Fly, the Mediterranean Fruit Fly and the Coddling Moth. While a lot of species have been introduced into Australian and find a niche in which to wreak havoc, the Queensland Fruit Fly is one of those native species that have flourished with the introduction of fruit by settlers. And the tricky thing about it and its cousin, the Mediterranean Fruit Fly, they have an annoying ability to infest fruit without you quite realising it. As for Coddling Moth, these annoying critters not only affect fruit ripening on the tree but also find their way into our pantries. Making short work of poorly stored grains, flours and other dried goods. I have a healthy respect for these little creatures. They are opportunistic and tough as hell. Keeping them at bay is a constant effort on our part. If you’re not careful, they can overrun your crop in what feels like a matter of days! An old joke I was told as a child still rings true … “What’s worse than finding a worm in your apple?” Why half a worm of course! And this is true. So how do we keep our fruit and veggies clear of these three debilitating insects? By carefully monitoring their activity and infestation. I will admit, that due to the amazingly wet Summer we have had this year, I was cheering about not having to water too often. I expected our zucchini to suffer some water damage and fungus … but that isn’t too hard to combat as they grow like weeds here! Some fruit swelling was also expected in the tomatoes and cherries, but I did not anticipate the rate at which the Fruit Fly have spread through our crops! What’s the big deal? You may ask. Fruit Fly and coddling moth larvae eat the flesh of fruit to grow. The adult fly pierces the flesh of the target fruit whereas the adult moth lays an egg (usually on the trunk or branch of a tree) from where the caterpillar crawls to the target fruit. Once the larvae hatch, the decimate the fruit. Turning it into an unusable mess. They have a relatively short growing cycle and are only treatable during the early stages of growth. Most commercial growers use strong pesticides which require a “withholding” period before fruit consumption. This means that the fruit is not fit to eat within a certain number of days after the chemical has been used. These chemicals are generally absorbed into the flesh of the fruit and kill the young larvae within. It is these chemicals which we avoid … but sometimes I wish to use them. Other chemicals work on the adults. For fruit fly, there are a number of bait and trap methods available. These are non invasive and do not effect the fruit or require a withholding period. We use these methods in our crops … but this wet season has taught us a valuable lesson … every day that it rains, check and potentially re-apply the baits! In the early AM, I will be destroying wheelbarrow loads of fruit because we were not diligent enough. 😦 A sad fact I know …. but on the bright side, the chickens will have a great feed! Here is what the infected fruit look like just off the vine. You can see the discolouration just under the skin showing indications of larvae damage. Inside, the fruit is a pulpy mess. You can see a couple of the white large in this image. It’s heartbreaking to have to destroy part of a crop … but if we did not, all our fruit would be affected. So the fight against fruit fly continues this season. Codling moth is mostly affecting our pears ATM … but we shall see how they fair in the ripening months ahead. Weekly baiting and dusting of our crops continue, but we are now ready for the next rains.